Hundreds already fill 13th Street outside the LGBT Center when I arrive for the rally. The expected rainbow flags and posters stick up above the crowd with messages calling for action, calling for peace, and honoring Marc Carson who was shot and killed three days ago in a hate-filled, reckless act. 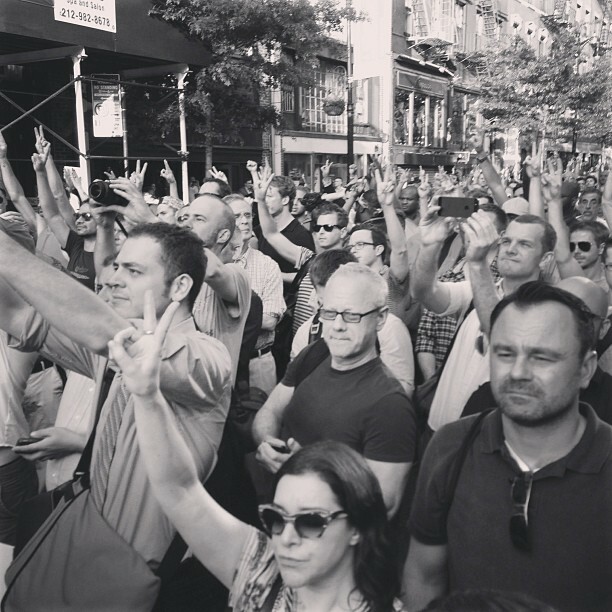 There have been four attacks on gay men in less than 2 weeks and this is the second rally to unite the community and make a stand for the queers of the city. With so much progress in recent years for marriage equality and a general acceptance for gays into society, it’s shocking that men are being singled out and attacked for being gay. This is not the NYC I know. The faces around me fill the spectrum of gender, age, and race and phones are regularly lifted aloft to snap pictures of the assembly. The afternoon sun is bright and hot and I smell a charming mix of cologne and BO emitting from all the queens, bears, and twinks (you might be surprised to know which were the smelliest). A piece of paper listing all the chants is passed around and I briefly scan it wishing I had brought a drum. Our march begins at a slow shuffle and people seem hesitant to chant. Middle-aged lesbians carry the calls and there’s something about their energy and ease at leading that tells me they’ve had to march before. I overhear two women talking about an AIDS rally from the early 90s. The young people next to me slowly gain the courage to clap and shout from time to time. We pass through the West Village–a historically gay neighborhood–going by the places Marc walked and died last Friday night. Our passage remembers him and clears out the residual darkness that clings to sidewalk. I meet a friend and chat about boyfriends and families while we march and feel the conversation is appropriate for the occasion. As we march for gay equality, I share the personal struggles I’ve had with being seen as an equal citizen, friend, and son. We reach the end of our route and are encouraged by multiple speeches from community leaders and activists. I think Marc’s mother speaks, but I’m too far back to be able to see and her voice is so weak in the microphone. We are told to unite, care for one another, and protect one another–wise words for anyone anywhere. The rally ends and in minutes 1,500 people disperse back into the city. I’m left standing against a police barrier wondering if there will be more violence to come and what I should do if it ever comes to me. As I head off I see a handsome stranger in the crowd and smile. He smiles back. The warmth and opportunity in that smile serves as a poignant end to today’s rally. This entry was posted in Queer Community and tagged gay community, hate crime, marc carson. Bookmark the permalink.